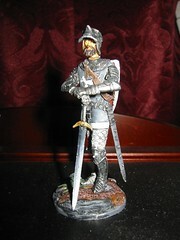 I found this kit, an Andrea Miniatures mini of Sir Lawrence Hastings, the Earl of Pembroke a while ago. It struck me how much it looked like Eddard "Nedd" Stark, standing with Ice, his Valyrian steel sword. And if you don't know who or what that is - go you, and read "A Game of Thrones" by George R.R. Martin. But, whatever the case, I stayed up last night more or less finishing this, and I'm going to give the results to Mr. Martin at his signing tomorrow. There's a couple more pictures on the flickr page, if you're curious. I used Pegaso paints, if that's of interest to anyone, too. Their colors and metallics are the best, though I will still stick with Games Workshop inks for washes, they're far and away the best for that. If possible, get a pic of you and GRR Martin. Only about 100 pages left to go in Feast for Crows. THIS BOOK IS ENDING TOO QUICKLY! No, since he looks fairly young, I'm imagining this was probably during the Greyjoy Rebellion. He'd have worn armor into battle, of course. You are using Pegaso nowm over Valejo? Sorry, Valejo - I missquoted myself. All those danged Spanish names! You're right -- the direwolf isn't stellar, but the rest of the armor looks pretty decent. P.S. Don't forget to pimp the charity drive to the local BwB! You are right about the direwolf but the rest of it looks great. Very well done. I should have Jeff hit you up for painting tips. He has recently picked up painting minitures and while he isn't bad, he could use some pointers. Mind if I show him your photos of Nedd?